This is the story of THE PAINT SHACK LLC. 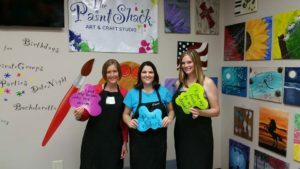 My name is Cyndi and I first saw this idea of painting parties in 2012 in Dallas. I thought this would be a ton of fun to do back here in Eau Claire. On the plane ride home I put some names of this sort of business on a to go container and The Paint Shack was one of them! I started slow, doing birthday parties for my kids in my garage (I have three, 11,13 & 17). I also did parties with the ladies at my church. When I started I made my own easels. I eventually invested in supplies and started doing classes at garden centers (thanks Green Oasis), peoples homes, bowling alleys and bars on their slow nights. The idea then turned into a leap of faith in the late summer of 2014 we became an LLC. I created a website with the help of books from the library and you tube videos. In January of 2016 we moved into our studio space where we are now 2524 Golf Rd 2C, above Ivory Piano Bar / Cherry Berry. We have expanded our canvas to more sizes. We also have added other products like the wood boards, wine glasses and canvas bags and SCREENS. Don’t tell my landlord but we have over 500 pictures on the walls in our building!! Come and see! We can do a party as large as 150 – and growing. Our largest party to date is 110 (Thanks Humane Association Fundraiser). We have combined forces with Cherry Berry for field trips. They give a great behind the scenes tour! I started this business for my kids. I wanted to be flexible to work around their busy schedules. I also wanted a place they could hang out and be with me if need be. They are becoming great painters and learning what it takes to start your own business! I have other social artist who work with me. Melinda, pictured far left, has been painting with me since day one. She is my encourager and sounding board. She has three kids as well and a full time job at Mayo reading Heart Monitors. She helps out painting where she can. I am lucky to call her my friend. We have some others who step in to help out where needed… and I am extremely thankful to them! Kristin , Anne, Bobbi, Angie and Stacie!